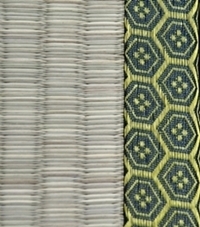 Tatami are a traditional Japanese floor mats. 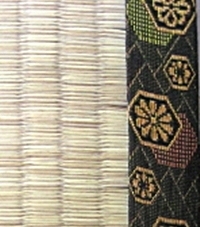 They are made by covering rice straw with a woven sea rush. 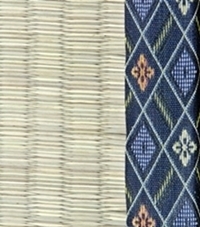 Tatami are made in individual mats of uniform size and shape, bordered by brocade or plain cloth. 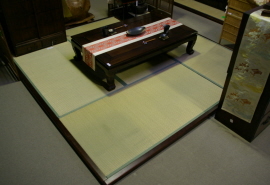 The size of a room in Japan is typically measured by the number of tatami mats. 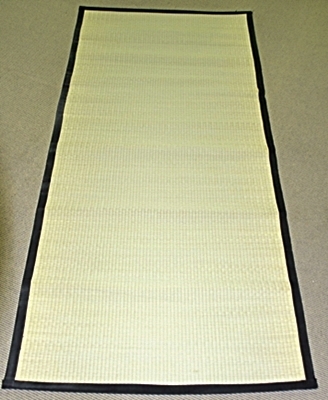 Standard dimensions of full mats are fixed at 90 cm by 180 cm (1.62m²). Although, these can vary between regions. Tea rooms & tea houses are traditionally designed to be 4½ mats. We can get them made to whatever size you want. However, as most Australian rooms aren't made with dimensions in 90cm increments, the most popular and stunning way to have tatami is to place the mats in a central position and surround them with floorboards to leave a flush finish. A thickness of 5cm is the most popular if planning to surround with floating floorboards. 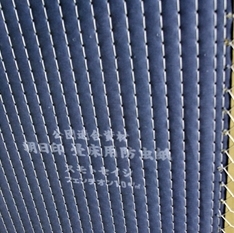 In Japan, all the materials used are cleaned and disinfected prior to manufacture. This is done without using any harmful chemicals and meets strict Domestic & International standards. They are sourced from Kyushu (South-west Japan). In Japan, it is illegal for untreated human waste to be used to fertilise food crops. This is not the case in other parts of Asia where cheap straw is sourced by non-Japanese manufacturers. The straw used for our mats is oven dried at 85 C for 8 hours to comply with our strict quarantine import permit regulations. This dries out the straw and denatures any seeds/pathogens in the straw. 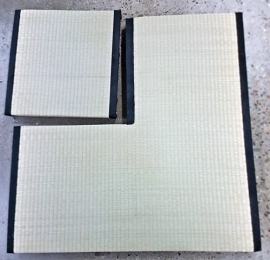 We guarantee that you won't find genuine Japanese tatami mats sold by our local competitors for a cheaper price. 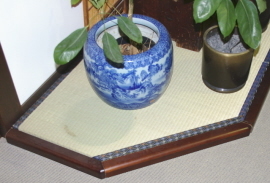 Since tatami is made from a natural product over time mats may shrink or expand depending on humidity. There may be an insignificant variation in length/width of +/- 5mm. Please consider this when ordering. Our couriers service Brisbane, Toowoomba, Sunshine Coast, Cairns, Townsville, Mackay, Sydney, Newcastle, Illawarra, Albury, Central Coast, Northern Rivers, Canberra, Melbourne, Bendigo, Ballarat, Geelong, Adelaide, Perth & Tasmania. If you live outside of these areas then we will find another courier. 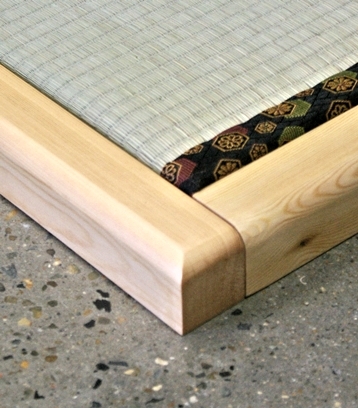 Delivery charges can be found on our Tatami Shipping page. 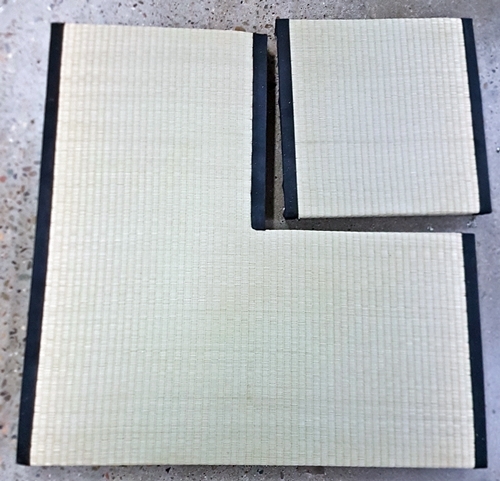 We can also supply you with wooden frames that lock our standard mats into place and you will only see the top of the mats (not the side). They help protect the edges from damage. 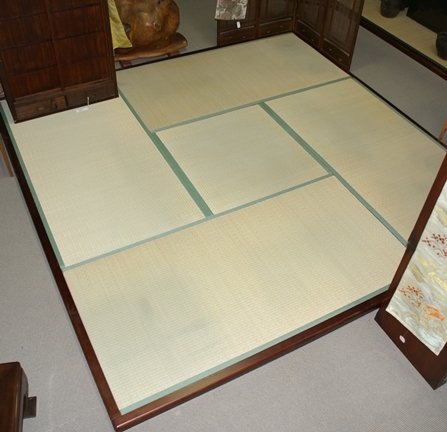 Prices shown include tatami mats and the wooden frame. 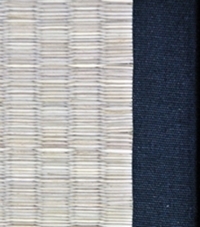 Goza Mats are the woven rush top piece (omote) of tatami. They are edged with black silk. They are not recommended for frequent traffic areas. Get tatami mats for those areas. 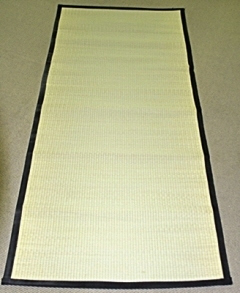 Mats are made from 90 x 90 x 5cm tatami. We are able to supply you with non-standard mats up to 2m long and 1m wide. Normal shipping is 2 to 6 months depending on our next container. Express shipping is 1-2 weeks (International courier charges apply = approx $1000 for 4 mats).